How to create Database in ASP.NET Core? 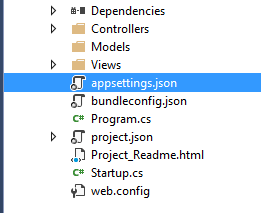 How to retrieve connection string from appsettings.json file? Till now, you have learned how to make a model class in asp.net core and how to connect it with the controller. In this chapter, you will learn the whole package including creating a model and saving data to the database. This chapter is going to be quite interesting because once you complete this chapter you will be able to apply your own logic to database and project. So, study this chapter thoroughly to understand the basic concept of working with the database in ASP.NET Core. 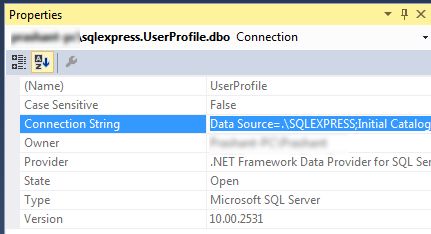 Here, I am creating a New Project UserProfile, that will ask user details and save into database. Step 1. Create New ASP.NET CORE project UserProfile with No Authentication. If you have problem in creating new project you can see this link. Step 2. Add a View Page Profile.cshtml under Home folder and add the following code. Step 3. 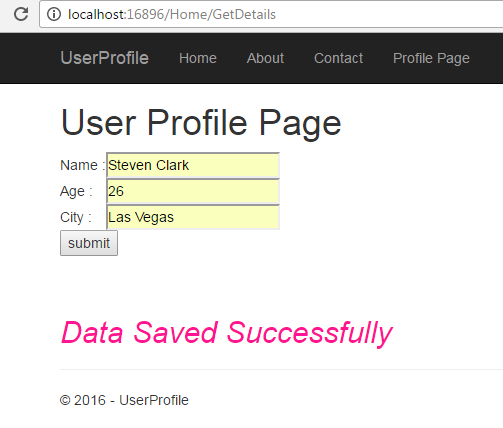 Create UserProfile Database to save these details. Go to View Server Explorer. 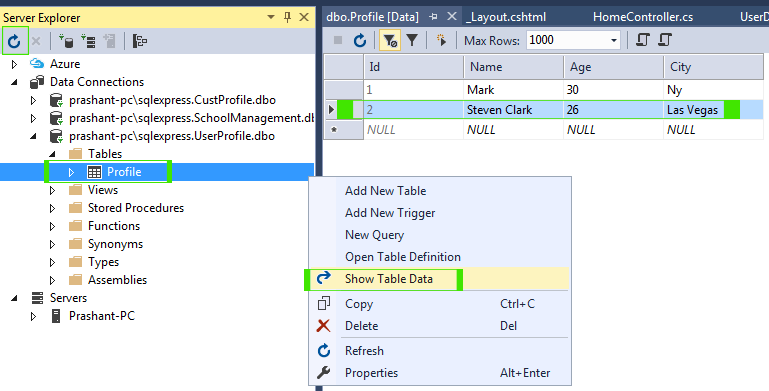 Right Click on Data Connections and select Create New SQL Server Database. Step 4. 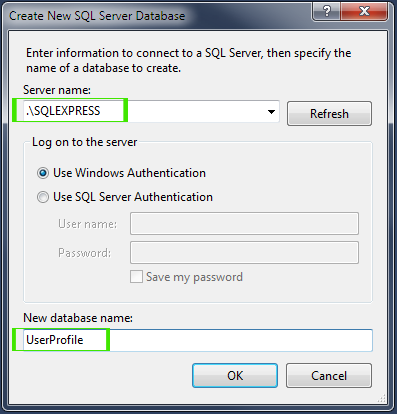 Enter .\SQLEXPRESS as Server Name and UserProfile as Database Name as picture below. Step 5. Expand UserProfile Database and then right click on Tables Add New Table. Design your table as picture below or paste the following script to design your table automatically. Then click on Update button to save your table. If you are designing your table yourself then don't forget to set Identity Specification = True for Id column. 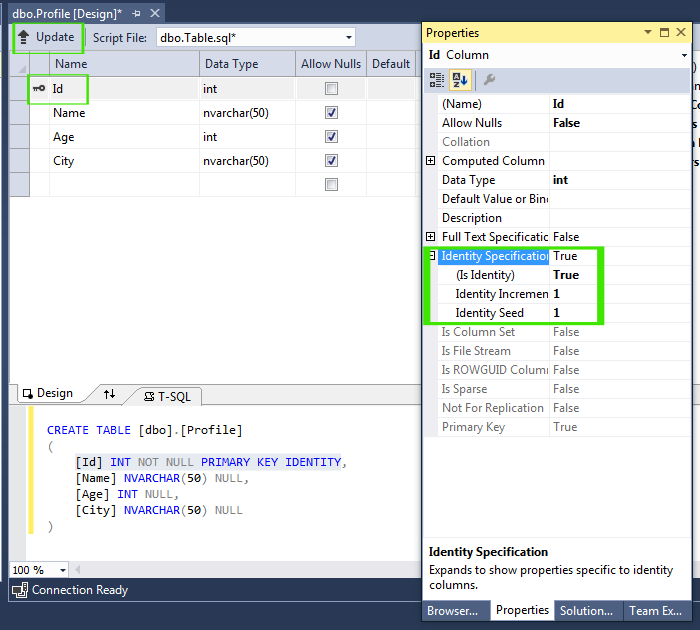 You can set it in properties windows for Id column. Step 6. 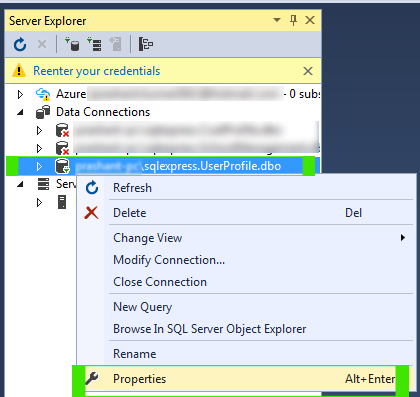 Refresh your Server Explorer to see your Profile table under your database. Step 7. 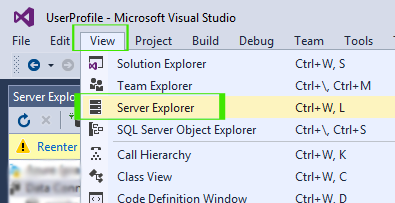 Go to Server Explorer, Right click on your database and select Properties. Here you can see Connection String. Step 8. Copy Connection Strings and Open appsettings.json file. Add your Connection Strings using following method. "UserProfile": "Data Source=.\\SQLEXPRESS;Initial Catalog=UserProfile;Integrated Security=True;Pooling=False"
Now, I will make a class in models folder that will access this connection strings when needed. This class file will return Connection String that will be used to connecting with your database. You must install Microsoft.EntityFrameworkCore.SqlServer to work with Sql Data Client. It is very easy to install. Go to Tools NuGet Package Manager Package Manager Console. Here, type the following command and Hit Enter. Package will be automatically installed and restored on your project within couple of seconds. Step 10. Create one more class file UserDataModel.cs in models that will handle input/output and saving details on database. Open UserDataModel.cs and paste the following code in it. Step 11. Now open HomeController.cs and add the following highlighted code. Step 13. It's time to execute your program. Press Ctrl + F5 or F5 to launch the website. Click on Profile Page Link to open your Profile Page. Now Enter some value in the field and press Submit button. Step 14. Refresh your database in server explorer then right click on Profile table and choose Show Table Data. You will see here that data has been saved here successfully. This chapter explains complete guide of MVC. Here, you learned how to design a form in View, How to write code in the controller, how to create a model class file and save data to the database. It is just a demo and you will learn more in next chapter.